There’s been considerable buzz about whether Belize is ready to dip a toe into the field of medical tourism. Tourism is the major source of revenue for this small country. Medical tourism could provide a significant boost in revenue for the country. But medical tourism is rife with potential pitfalls. Recently the Inter-American Development Bank (IADB) and the Belize Trade and Investment Development Service (Beltraide) initiated the first step in this process. They held their first public workshop on August 3rd. It was held at the George Price Center, in Belmopan. 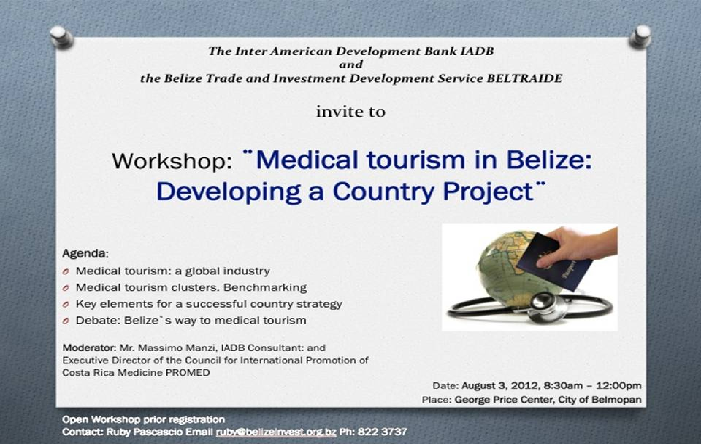 The IADB hired a medical tourism expert to lay the groundwork to develop Belize’s sustainable medical tourism plan. The Costa Rican consultant, Mr. Massimo Manzi, moderated the recent workshop. He presented an overview of the study he’s leading. Mr. Manzi is the Executive Director of ProMed (the Council for the International Promotion of Costa Rican Medicine). He developed Costa Rica’s highly successful medical tourism model. He now offers his expertise to other countries to assist in developing their medical tourism models.